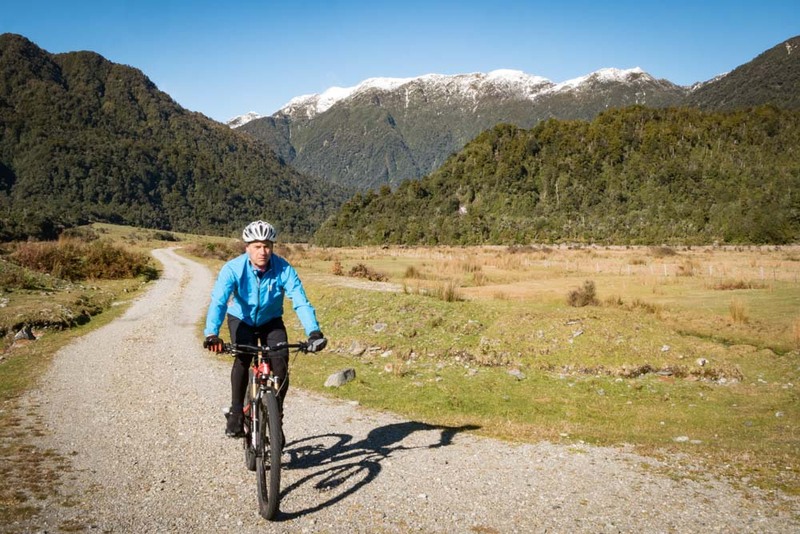 The stunning West Coast Wilderness trail, stretching from Greymouth to Ross, is recommended as a 4 day bike ride. I’d been hoping to experience this 132 kilometre wild west ride since it officially opened in 2013, but finding the time was always the issue. It’s quite a drive from Blenheim just to get to the start. But right in the depths of winter a very short window of opportunity opened for me. Could I knock the bugger off in a day? No – at least not back to the car. 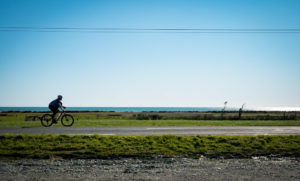 But the most scenic part was a possibility, from Kumara to Hokitika and back. The plan was thus formed, but what is it they say about the best laid plans? I rolled up to my start line in Kumara in some discomfort. Being the coldest weekend of the winter thus far, I had various plastic bags swathed around (most of) my extremities. And my boy had left me a parting gift; his vomiting bug. It had been a rough night. But my ailments were quickly forgotten as I pedaled off on the beautifully groomed gravel path. 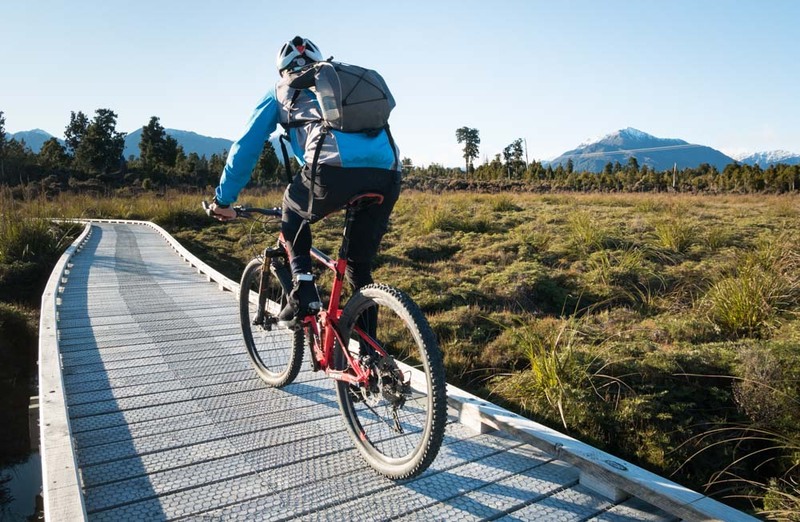 As part of Nga Haerenga (the New Zealand Cycle Trail), the West Coast Wilderness Trail is a good example of the government’s ambition for the national project. 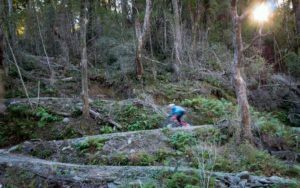 There have been some concerns along the way – questions raised about trail safety, destructive west coast washouts and budget overruns. 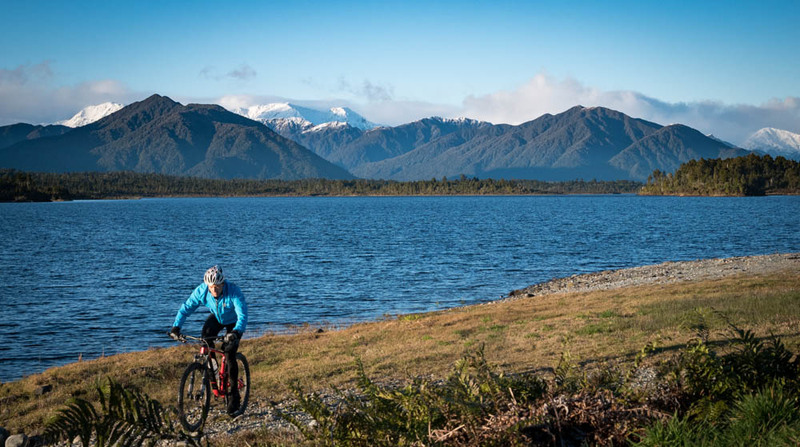 But setting off, with the pristine scenery of the Kapitea Reservoir and snowy Southern Alps as a backdrop, I simply felt very fortunate to be able to experience Westland in this way. Beyond the reservoir, the trail narrows, twists, turns and passes the occasional gold mining relic from bygone days. You can stop and be educated at the information boards, or just pedal on by. (With time being of the essence, I chose the latter). As I headed further inland the trail steepened. The expansive views from earlier had given way to dense bush and crystal clear streams, as well as the occasional river crossing. 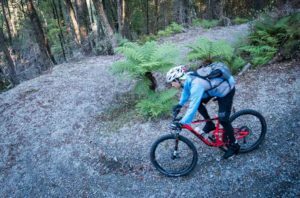 Before starting, I had been expecting something similar to the Central Otago Rail Trail, but the West Coast Wilderness Trail is a little more technical, and for a mountain biker, a lot more fun. It’s still easy Grade 2 riding though, with the main hazard being the loose gravel corners. (And the sandflies of course – in summer). After a couple of hours riding, the trail morphed into a shady switchback descent down to Cowboy Paradise – a very nice way to finish the first section. Cowboy Paradise, a small Wild West replica town, really is something different. Although under construction, it offers accommodation, refreshments and other oddities such as a shooting range. I didn’t loiter though, pushing onwards towards the wide open spaces beside the swift flowing Arahura River. 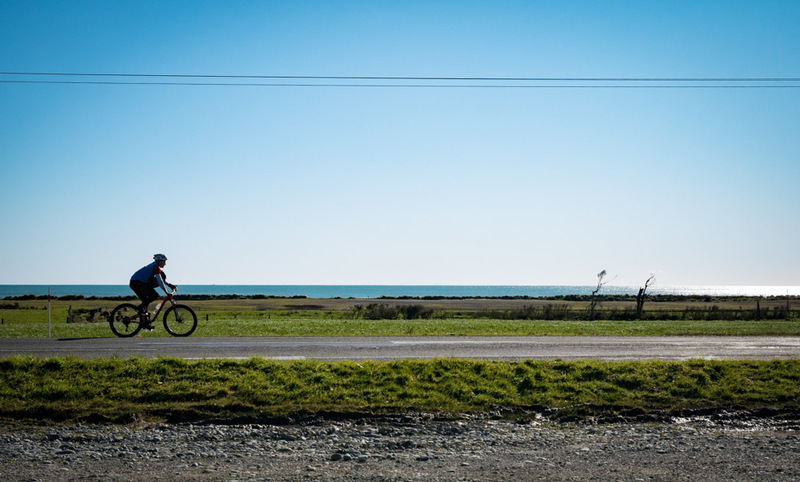 My legs were feeling worryingly weary and I was still 30km out from Hokitika. But an elixir came in the form of another fun little descent, this time under the invigorating sun. I then made good time on a flattish stretch of road which culminated in the tranquil Lake Kaniere. Stopping by the lake, I realised that things weren’t going so well. My son’s parting gift must have really taken it out of me, and I also became aware that, due to the freezing temperatures, I hadn’t been drinking as I should. Maybe a man sized chocolate hit could revitalise me? I still had five hours of daylight ahead so surely I could still make it back to the car. Sure enough, the chocolate gave me a boost. 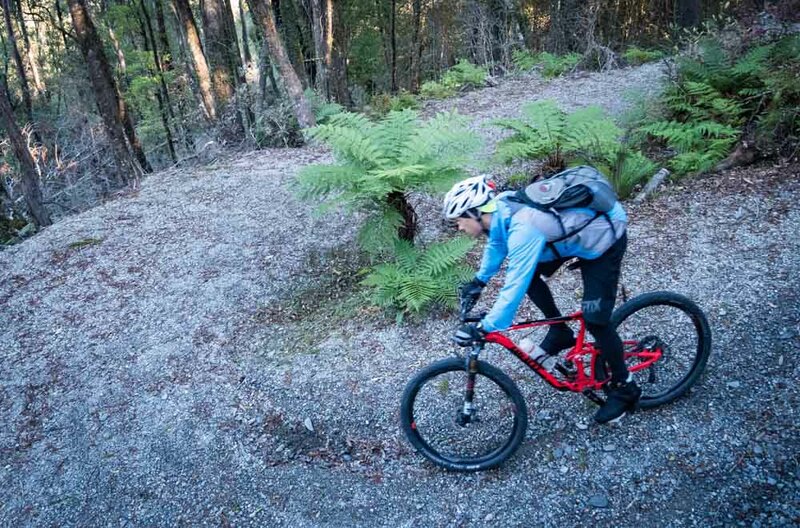 And what’s more, I was embarking on the most enjoyable part of the ride – the Kaniere Water Race walkway. 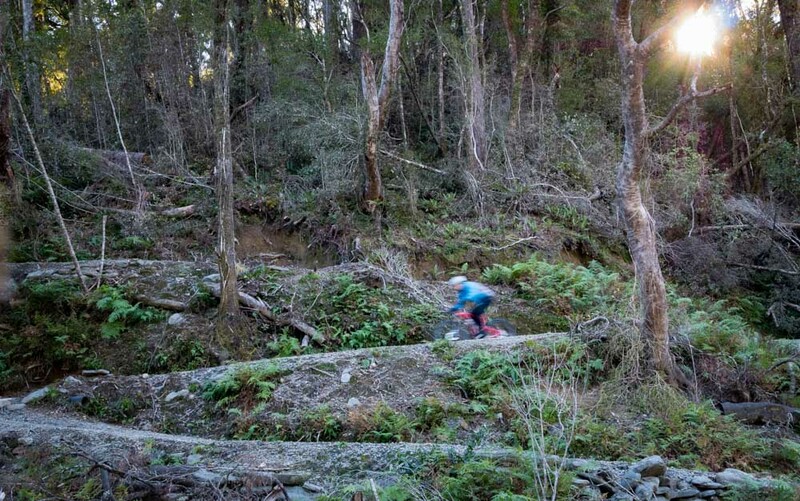 This narrow windy section follows an old water race dating back to the 1870s. But before long there was further confirmation of my depleted state. This time I simply rode off the innocuous trail right into the creek. The bike was fully submerged and I only just scrambled out before joining it. Somewhat damp, I continued to wind my way through the native bush before spilling out onto the road. Now it was just a pleasant jaunt through open country to Hokitika. Well, it would have been pleasant, but now my limbs really were waving the white flag. 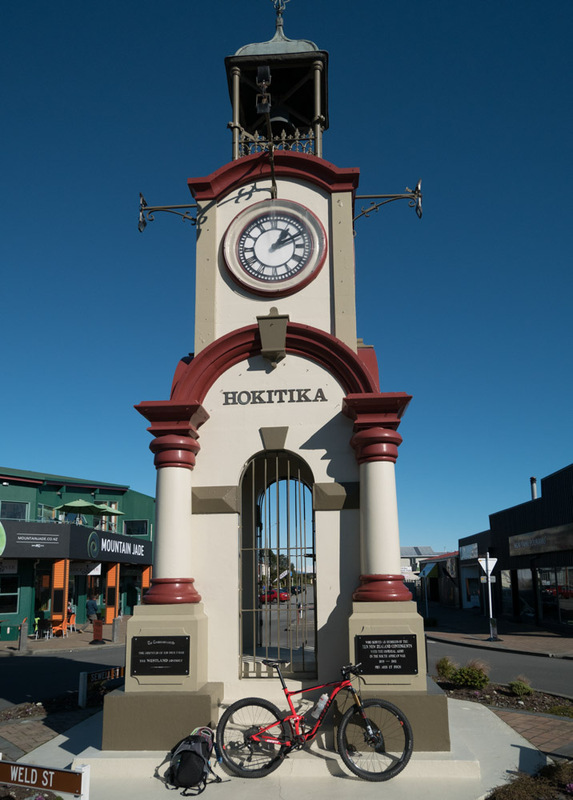 I limped into town and collapsed beside the Hokitika River, while Mt Cook gleamed imperiously in the distance. The original plan had been to retrace my route to the car via the trail. However, there was no denying that I was a wreck. As much as it pained me to admit defeat, it would pain me more to collapse beside some forsaken west coast relic and join the ghosts of the trail. So with my tail between my legs I aborted the challenge and slunk back to the car via the main highway. So I toiled north with the Tasman calm and blue on one side, whilst the deep green west coast terrain taunted me for my weakness on the other. After what seemed an eternity a small settlement appeared ahead. The end was nigh! After seven hours of being humbled by the West Coast Wilderness Trail, I’d wager that Kumara never had a traveler more relieved to arrive. During an exhausted drive home, I realised I’d underestimated the trail. It might not be classed as a true mountain bike ride but it had taught me a thing or two. Sometimes schedules and deadlines should be put aside and time taken to enjoy the moment. And there’s plenty to enjoy with landscape that is Pure New Zealand; snowy mountains, crystal clear rivers and brooding untouched ancient forest. I vowed to return, and next time do it on West Coast time.